Thank you to the groups below that are so essential to ensuring that as many fallen heroes are remembered and honored at Jefferson Barracks National Cemetery (MOJBNS) on Saturday, December 14, 2019 at 11:00 AM. Welcome to Gateway Blue Star Mothers MO04 (MO0044P)! Our location fundraising group is proud to support Jefferson Barracks National Cemetery and to help honor and remember as many veterans as possible. Please click "View" to learn more about our effort and then click "Volunteer" to join us for National Wreaths Across America Day. Thank you so much! Welcome to Missouri Society of Mayflower Descendants (MO0007P)! Our location fundraising group is proud to support Jefferson Barracks National Cemetery and to help honor and remember as many veterans as possible. Please click "View" to learn more about our effort and then click "Volunteer" to join us for National Wreaths Across America Day. Thank you so much! Welcome to Team Leidos (VA0448)! Our location fundraising group is proud to support Arlington National Cemetery and to help honor and remember as many veterans as possible. Please click "View" to learn more about our effort and then click "Volunteer" to join us for National Wreaths Across America Day. Thank you so much! Welcome to Team pat stanley (MO0084)! Our location fundraising group is proud to support Jefferson Barracks National Cemetery and to help honor and remember as many veterans as possible. Please click "View" to learn more about our effort and then click "Volunteer" to join us for National Wreaths Across America Day. Thank you so much! Welcome to Scott Spouses' Club (IL0118P)! Our location fundraising group is proud to support Jefferson Barracks National Cemetery and to help honor and remember as many veterans as possible. Please click "View" to learn more about our effort and then click "Volunteer" to join us for National Wreaths Across America Day. Thank you so much! Welcome to Scott Civil Air Patrol (MO0074P)! Our location fundraising group is proud to support Jefferson Barracks National Cemetery and to help honor and remember as many veterans as possible. Please click "View" to learn more about our effort and then click "Volunteer" to join us for National Wreaths Across America Day. Thank you so much! Welcome to Day & Zimmermann - Veteran's Employee Resource Group (PA0365)! Our location fundraising group is proud to support Arlington National Cemetery and other locations across the US and to help honor and remember as many veterans as possible. 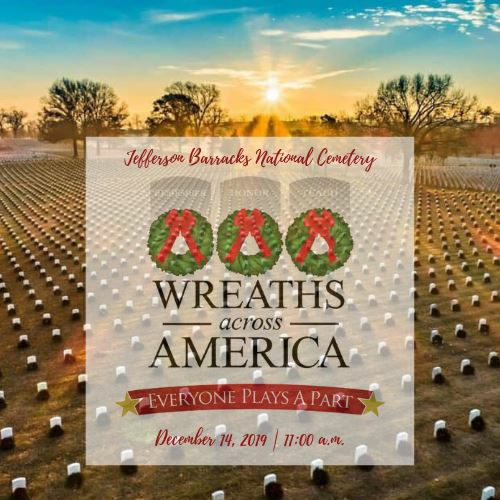 Please click "View" to learn more about our effort and then click "Volunteer" to join us for National Wreaths Across America Day or any other location you would prefer. Thank you so much! Welcome to Battlin' Betties Missouri Platoon (MO0077P)! Our location fundraising group is proud to support Jefferson Barracks National Cemetery and to help honor and remember as many veterans as possible. Please click "View" to learn more about our effort and then click "Volunteer" to join us for National Wreaths Across America Day. Thank you so much! Welcome to Weeks Hope Academy (MO0080)! Our location fundraising group is proud to support a participating cemetery and to help honor and remember as many veterans as possible. Please click "View" to learn more about our effort and then click "Volunteer" to join us for National Wreaths Across America Day. Thank you so much!